Austerity spending cuts are driven more by the current government's ideological commitment to reducing the tax burden than their desire to reduce the deficit. 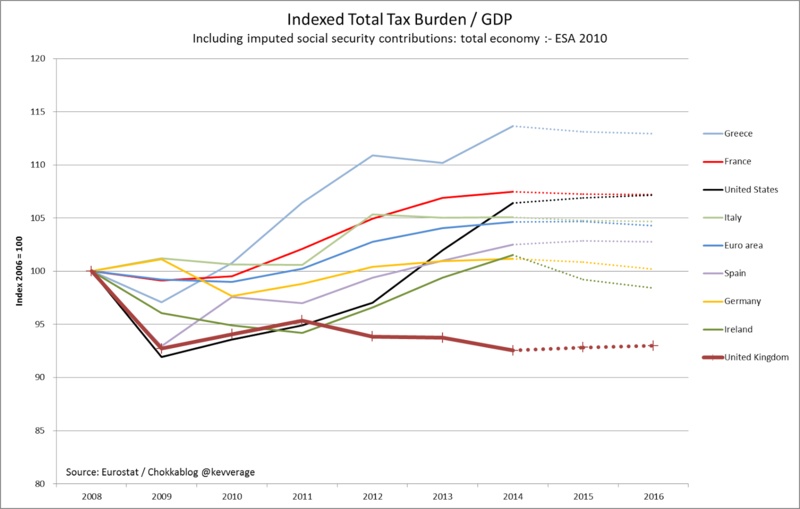 This graph uses Eurostat data to show how the tax burden/GDP has changed (and is forecast to change) for a range of countries. The UK is the only one of these countries to have materially reduced its tax burden over this austerity period. 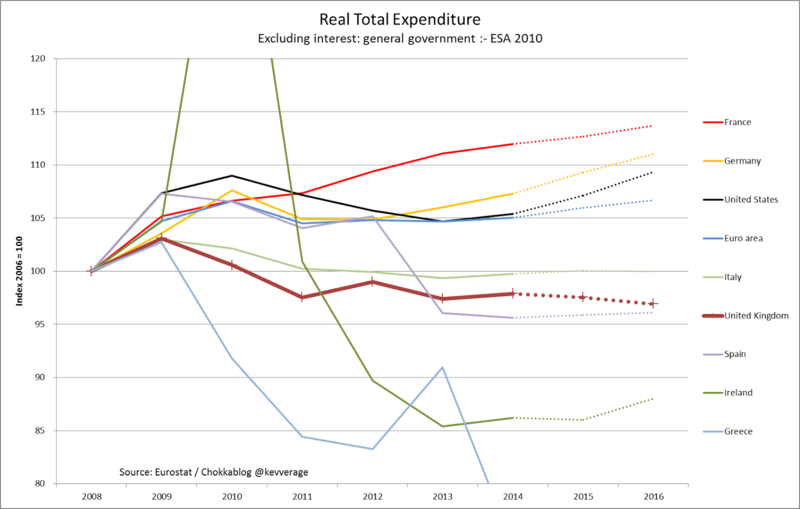 The relative severity of the UK's spending cuts is clear - only the extreme cases of Ireland and Greece (and to a lesser extent Spain) have suffered more. I've kept the index scales the same so we can visually appreciate the difference between these two trend lines. If there was no GDP growth the sum of these two lines would roughly1 show us the trend in deficit. Of course in reality GDP growth acts as a multiplier to dampen (or potentially reverse) the trends we see in the first graph, so a key judgement call is whether the reduction in tax burden drives GDP growth more than the associated reduction in expenditure slows it. I would tentatively suggest that those countries which have been willing to use taxation to fuel spending (or at least haven't reduced spending to enable tax cuts) are currently seeing a better net outcome in terms of deficit reduction. The core "anti-austerity" argument is that government spending is a key driver of economic growth, so to cut spending during an economic slow-down (and particularly when interest rates are close to zero) is damaging to the economy. It strikes me that if you look at the data it shows that the main driver of reduced spending in the UK is the obsession with reducing the tax burden. I wish more politicians had the courage to address that issue head-on. Now of course if you're ideologically committed to reducing taxes you might argue that this is all well and good. Nobody wants to pay more tax in the same way that nobody wants austerity - and there are plenty who believe we should live in a lower tax / lower spend economy. I don't share that view, but I can understand it. But even those who believe that a government's primary objective should be to reduce the tax burden (as opposed to, say, caring for the least well-off in society) must surely question the timing. Should we be reducing taxes and therefore reducing spending at a time when most would agree that the economy would benefit from increased government spending "if we could afford it"? I've commented before that CEOs - who should be focused on long-term shareholder value - are actually incentivised to maximise "CEO lifetime remuneration value". I suspect most chancellors are in a similar situation; they are incentivised to make policy decisions which improve their chances of short-term political success rather than serving the long-term interests of the economy. Cutting taxes is awfully popular - as long as voters don't draw the connection between this and the hardship caused by "austerity". "I would tentatively suggest that those countries which have been willing to use taxation to fuel spending (or at least haven't reduced spending to enable tax cuts) are currently seeing a better net outcome in terms of deficit reduction." I think what's going on here is that the Eurozone countries - to a much greater extent than the UK and US - *have* to fund their spending via taxation. They cannot create money like we can and if they borrow to fund a spending deficit they cannot manipulate the price like we can (central bank, base rate, QE, etc.). If they want to borrow, they have to pay the market price and given the state of the Eurozone and the possibility of default (which we don't have), the market wants a high price. So this ties the hands of the Eurozone governments to a much greater extent that us or the US. So it looks like they are "doing better" in terms of a their deficits, but the point about getting an economy through a recession is that it is the spending in excess of tax (i.e. the deficit) that matters in terms of stimulation. The Eurozone is unable to do this to the same extent we can so their deficits look smaller but their economies look much worse. It doesn't matter whether you increase spending or reduce taxes in order to stimulate the economy during a recession - both do the same thing, open up the deficit so that the government is adding more money to the economy than it is removing. A tax decrease during a recession would be a perfectly respectable policy if spending is kept the same. If the government increase or decrease both spending and taxation, then to the extent that they deficit stays the same it wouldn't provide much of a stimulus. It might cause a desirable redistribution of income though. I'm not sure that both tax reductions and spending increases really "do the same thing" (other than at the most macro level). Spending on big infrastructure projects (for example) is surely a more direct and reliable way of driving economic activity than reducing top rate income tax (for example) which relies on the resultant behavioural change filtering through to productive economic activity (e.g. the money saved being spent here and not elsewhere). Yes, I agree with that. But if the tax reduction was at the lower end or on VAT perhaps, then it might be closer to being a similar effect. From a macroeconomic perspective, tax hikes are definitely "austerity", not "anti-austerity". But the people who don't like austerity tend to like high taxes for non-macroeconomic reasons, so there's a lot of confusion over this point. One of the lessons learned from the US stimulus is that big infrastructure projects take an awful long time to get started with all the environmental and other planning permissions you need to have these days. By the time you break ground on your bridge or road, the recession you were trying to fight is probably over. Also, the construction industry is a lot more capital-intensive and less labor-intensive than it was when FDR started the WPA , TVA and other depression-era infrastructure projects. Bottom line is that big infrastrcture projects are not really suited to be counter-cyclical injections of money into the economy anymore, if they ever were. "there are plenty who believe we should live in a lower tax / lower spend economy. I don't share that view"
I do share that view, largely because I believe I should enjoy more liberty to spend the money I have earned, as I'm better at it. When you consider the long-term lack of public investment in retirement funding, the unavoidable requirement to replace ageing power generators, NHS IT follies and the disastrous use of PFI funding for schools and hospitals as examples, you would struggle to persuade me government spending is efficient. Add to that the folly of "renewable" energy projects, which are extremely costly and are 100% unreliable, and you have increased long-term costs for very little, if any, gain. We also have more government than we used to, with each layer interfering in our daily lives in an effort to justify their existence. Every policy whim has to be paid for, whether we want them or not, so, yes, we need some government, but not nearly as much as we have and not in control of such a proportion of our hard-earned cash. It doesn't matter whether or not we have more or less than anyone else, we have far too much. I think you have taken an overly narrow view of UK Government “austerity”. First, look at UK Government debt as a % of GDP. It has shot up from 43% in 2007 to 90% currently. UK Governments of both shades have borrowed and spent like crazy in the past 8 years. As the seminal work of Carmen Reinhart and Kenneth Rogoff has shown, 90% is a figure at which governments should become wary lest their debt dynamics become untenable. France has a figure of 94% and Germany 78%. Compare these with two, arguably better-run, countries, Australia and New Zealand, which have figures of 27% and 38% respectively. And then look at Italy at 133%. Second, and as a consequence of the first point, the UK government currently spends about £43 billion (3% of GDP, or about 7.5% of its revenue) servicing its debt. (The corresponding figure for Japan is 25%. Do you really want to go there?) Remember, this is in an era of unprecedentedly low interest rates. A four-fold increase in rates (not impossible in the medium-to-long term) could easily see UK governments spending 20-30% of their revenues on debt servicing. I personally, find this an uncomfortable prospect. Third, current UK Government expenditure as a percentage of GDP is about 40%. This is slightly lower than under Thatcher but higher than under New Labour. Revenues since 1990 have been fairly stable, which explains why Thatcher, Brown, and Osborne have been running budget deficits. I, personally, feel that trying to balance budgets is a perfectly rational aim if one is trying to stabilize the UK’s finances in the medium-to-long term. The idea that the current UK Government expenditure represents austerity is laughable when viewed historically. Finally, and as I have said before, the SNP focus on “Westminster austerity” is cant. FFA or Scottish independence have to be paid for by surrendering the Barnett formula, accounting for about 12% of Scottish Government revenues. This would produce eye-watering austerity in Scotland unless offset by substantial oil revenues. These have now largely disappeared for the foreseeable future. As far as my understanding goes, the concept of the 90% debt as a % of GDP threshold has been dismissed as pretty much bunkum by the academic economics community (it may even have been based on erroneous calculations). There's an article about this by Paul Krugman in the Guardian (I believe it's linked to in the comments on Kev's previous blog). The % of GDP used to service debt is also a bit of a red herring, given that the UK is a sovereign currency issuing state. The last 5-7 years have shown us that, as a state able to print its own money, we can get away with a lot without it affecting the strength of our currency (£ is a much safer bet than €). We can, therefore, always print more money to service debt and maintain a reasonable cost as a % of GDP. Provided, of course, we don't do anything crazy to risk the safety of our bet (like, oh I don't know, electing Jeremy Corbyn). You're bang on on the SNP's limited arithmetical ability though (and we can also add in the dangers of losing the currency issuing power of the pound). 1) Reinhart and Rogoff have indeed proved controversial. But their data came in two parts: an historic survey covering 200 years to the present and a shorter survey covering the years since the Second World War. The first survey stands, as far as I am aware, but the second was criticized, notably by Herndon, Ash and Pollin in 2013. There were clearly some data issues with the original Reinhart and Rogoff paper, and the sharp cut-off in GDP growth at about 90% doesn’t exist. However, Herndon et al. divided the GDP-to-debt ratio above 90% into two parts: 90-120%, and above 120%. Average growth in the 90-120% bracket is 2.4%, whereas is 1.6% above 120%. So, although the sharp cut-off at 90% has gone, a decline in GDP growth with increasing debt appears to be sound – a negative feedback loop. The latest World Bank estimate has UK GDP-to-debt ratio at 97% in 2013. Unless the UK deficit is addressed or GDP increases rapidly, the GDP-to-debt ratio will arrive at 120% within a decade, possibly sooner, lowering GDP growth. There is therefore pressure on a prudent chancellor, looking at the medium to long term, to get the deficit down and maintain higher levels of GDP growth. I agree it is possible to capitalize interest and add it to Government debt, but external creditors usually like to be paid. Moreover, Argentina and Venezuela, to name but two, show that an independent currency is no panacea. By the way, forget Krugman. He doesn’t like competition, particularly from Harvard. As for Corbyn, we seem to agree that he wants “Peoples’ QE”; i.e. direct helicopter money without the intermediation of the Bank of England. The first few minutes of “Peoples’ QE” will be fantastic, but as soon as bidding starts for limited assets, prices will rise and real inflation will be on its way. At least QE in the hands of central banks leads to asset purchases that are, in principle, reversible at some time in the future. Only time will tell if that is the case. 3) I’m glad we agree on the poor arithmetical skills of the SNP. As Daniel Kitson pointed out in Edinburgh this week, the future is not the mystery many think. It is instead the “slowly accruing consequences of the present”. Under the SNP, those accruing consequences will be truly horrible. At risk of boring you, I should like to return to the arguments I put forward a week or so ago. As you know, I am highly sympathetic to your objective of debunking the SNP’s economic case for independence. However, I do need to say that your broad anti-austerity thrust is dangerously unfounded. The Bank of International Settlements (BIS) has just published data on the fiscal positions of some important countries. As far as general government debt as a percentage of GDP is concerned, the UK is at the upper end of countries that would be regarded as responsible managers at just under under 100%. Close to the US, Canada, a bit above Germany, etc. But look at who the high figures belong to: Japan, Portugal, Italy, Greece, and Ireland. Let me ask you; do you really want to go there? 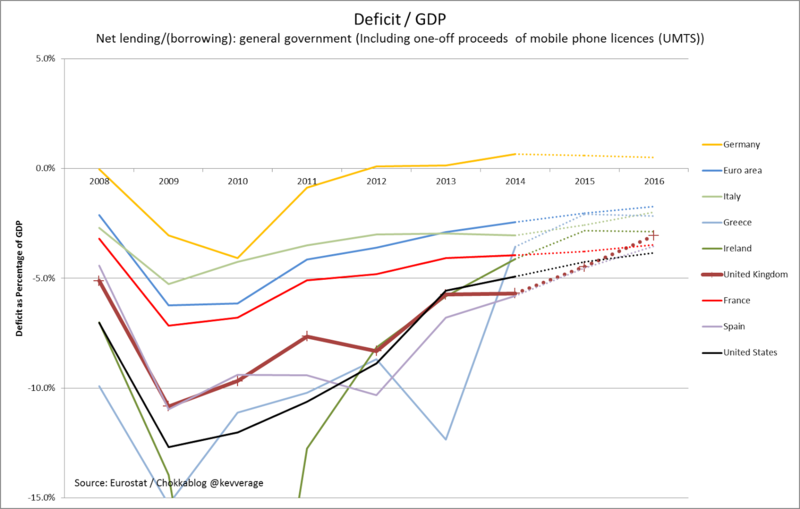 Because current UK (and Scottish) budget deficits will get you there quite quickly. An independent Scotland, starting at just under 100% will get there faster unless it introduces substantial budget cuts. Even more telling, the BIS shows data for twelve major countries, every one of which is currently reducing its debt servicing costs. The UK is in a group that raised government debt substantially in response to the crisis of 2008, but that paragon of virtue, Germany, is also steadily reducing its debt servicing costs. Their recent trajectories are remarkably similar. The idea that the UK is some sort of economic outlier is complete rubbish. What you see is an attempt in the UK to rein in government deficits after a massive increase in government debt since 2007. Even Corbyn's new shadow chancellor thinks you should live within your means and balance budgets. The idea of austerity, however, is appealing to the unscrupulous, notably the SNP, and excellent fodder for the SNP grievance machine. Your laudable campaign to ridicule the SNP won’t achieve much if you pander to their rhetoric. The unpalatable truth is that the SNP already runs large budget deficits, despite a large subvention from rUK. The SNP is not opposed to future austerity, provided they can achieve independence first. Goals of a second IndyRef by 2021 may miss the boat, anyway. 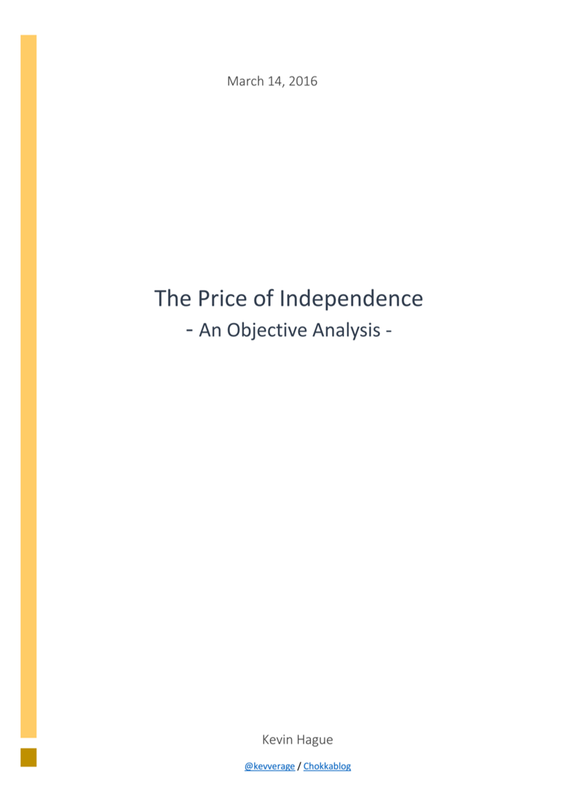 In the event of independence, Scotland needs to prepare for, at best, a volatile peg with the English pound, and at worst, joining the Euro; plus eye-watering budget cuts. The EU will insist on budget deficits limited to 3%, and businesses will opt for rUK in many cases, to avoid operating in two currencies. Meanwhile, Scotland needs to prepare for a real border, with customs posts. Because England, in its current mood, will not tolerate anything that remotely smells of Schengen. 3. If by "anti-austerity" you mean being in favour of printing money to boost investment and increasing public spending while our deficit is at current levels I'm not anti-austerity (although I think some increase in infrastructure capex may be appropriate). 4. If by anti-austerity" you mean being unhappy with how the pain of current austerity measures have been shared - in particular that the poorest 30% of society have been disproportionately harshly affected - then I suppose I could be called "anti-austerity"
Reading through a great many of your blogs, what you’re saying makes a great deal of sense, like you, I'm not an accountant or an economist, but you spell things out in order to make people like myself capable of understanding, I fully understand your argument for debunking the SNPs economic case, but is that where it ends? Is this just another anti-SNP site? It is hard enough to find constructive websites where the commentator has the rare ability of remaining impartial, so I was hoping I could come across someone that could argue/debate both sides, sniping is all very well, but very rarely are we offered genuine alternative opinions, what [for example] is "good" about remaining within the Union? Does Scotland get a good deal? Could it be better? IF we find ourselves Independent in the future, what are the benefits? Are we doomed? @kevverage you really do believe that Scotland uniquely couldn't manage on its own, don't you? Why don't you just say it? This confused me, when you said "Of course we could"? Firstly, I take it this £8bn is our share of the National debt, and as such - I again take it - that this amount was borrowed by the UK gov on Scotland's behalf? The question I have is, did Scotland ever need to borrow this money in the first place, for Scotland? Or do we just contribute to the national debt regardless of where the money ends up? Would there be [for example] this recurring annual amount of borrowing [or more] in an Independent Scotland? And IF so, then how could Scotland possibly manage on its own? The £8bn is not a share of debt - its how much bigger our *annual* deficit would be, how much *faster* we'd be accruing debt than we do by sharing with the rest of the UK. Thank you for your response and explanation, 12% does seem pretty massive, I take it that that figure is dependent on our fluctuating oil revenue ie: if oil prices are high then our deficit is lower? I'd imagine there'd be certain savings in an iScotland, such as UK infrastructure, trident, foreign office services etc would this saving be sufficient to negate the 12% [or at least a part of it] would you say? I've often read about Scotland putting more into the UK economy than getting back, for ex: 2013 "Scotland generated 9.9% of the UK’s total tax revenue with only 8.4% of the UK population When you add in the Barnett Formula, our share of the UK expenditure rises to around 9.3%". Obviously 9.3% is lower than 9.9% so I guess in this year we'd have had a 0.6% excess? I just wonder, had we taken our figures over a longer period - say for the last 20/30 years - rather than a snapshot - would Scotland still be reliant on a [near to] 12% cut across the board? Or, is that figure just for a future iScotland? Kevin, do you take requests? If you are feeling like being a blog jukebox I'd love voting patterns to be Kevverage-d.
My sense is that the votes of the Lib-Dems and Labour in RUK for pretty much every election bar 2015 since the war outnumber Tory votes. For example, in 2010, Lib-Dems and Labour in England received 13m votes to the Tories 10m. If this holds as true across the last dozen elections then for any scottish voters whose main gripe is that they vote labour but get tory governments, their focus should be on reforming first past the post (and power to their elbow). And any nationalists who make the case that Scottish people are more liberal and left wing than RUK should be challenged robustly for being so insidious and plain wrong.